Welcome to this months One Stamp At A Time Blog Hop! I just can't get over how cute Andrea's stuff was!! I can't believe that summer is almost over and the kids are heading back to school! Which is our theme this month... Back to School! If you KNOW me, I am the mother that crafts for EVERY party... I even offered to make 30 Teacher Cards to welcome our elementary school teachers back to school! I really had fun making these cards and I can't wait for you to take peak!!! Here are my goodies! They are a little of something old, something new, something borrowed and unfortunately I didn't use blue! In these projects I used Stampin' Up! Unity Stamps and a CuttleBug embossing folder! I started this card with a lovely base of Mossy Meadow Card Stock, With a quick layer of Tip Top Taupe. The Very Vanilla layer is stamped using the Hardwood stamp with Tip Top Taupe ink. I then cut about a 2 inch strip and embossed with a Chicken Wire embossing folder from Cuttlebug. The dotted lace trim was glued to the back before adhering the strip to the Hardwood. 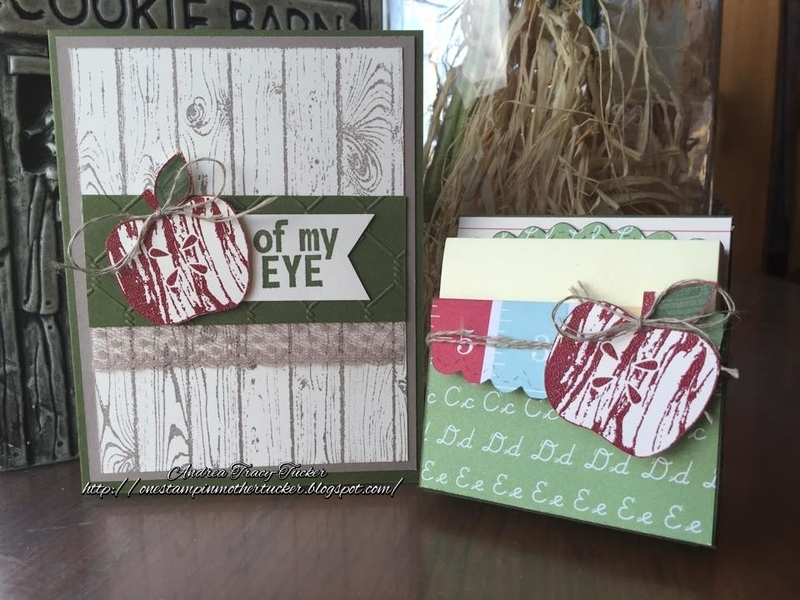 The Apple and "of my eye" is from Unity Stamp Co. I stamped the sentiment on the Very Vanilla card stock with Mossy Meadow ink. 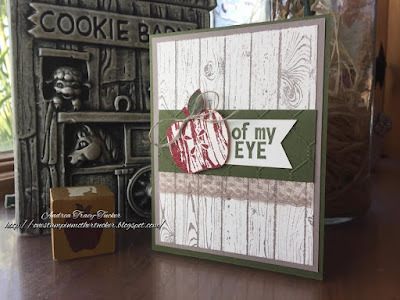 The Apple I made by using Cherry Cobbler Stampin' Emboss Powder. The leaf was colored in with Mossy Meadow. 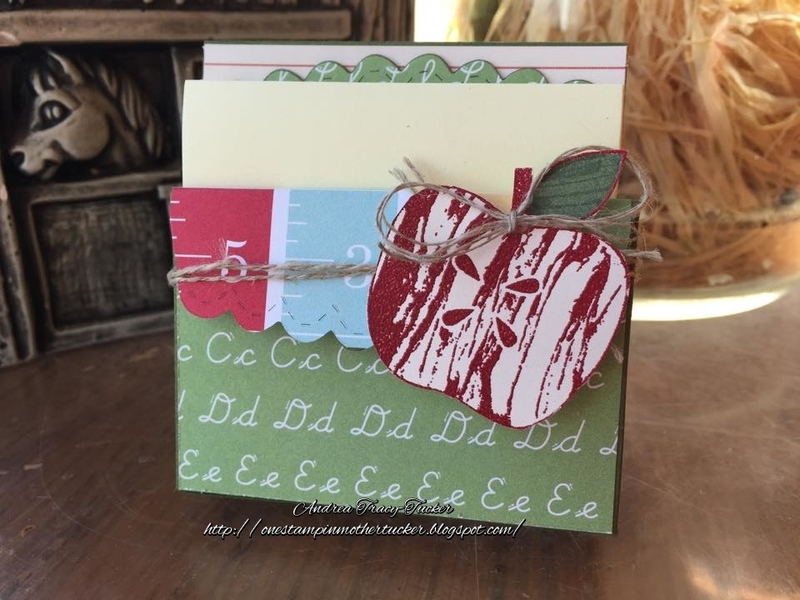 I finished off this great card by adhering the apple with Stampin' Dimensional and a Linen Thread Bow at the stem! My cute little Post-It Note holder I made using Mossy Meadow Card Stock as the base so that it would coordinate with the card. I managed to find a retired school themed paper that went well with the card stock. Then embellished with linen thread and a heat embossed apple much like the one on the card. Finished with a linen thread bow! You can get the Post It Note Tutorial here. Thank You all so much for touring the hop!! Wait to until you see what Martie has whipped up for you!! She is so talented! I so want a bite of those apples! HA.... you're project are just so friggin' cute! Did you make three sets? Damn this is hot! Love the post holder and matching card! Someone's teach is gonna be happy! Thank you so much for the tutorial! I love both of your projects so much! I must say these teachers are getting a royal welcome back to school. Awesome Andrea!! I love this vintage feel! You did another amazing job! These are too cute.... love the apple touch! Andrea your card is beautiful and I love the post it note holder!! Such a cute set Andrea. I love both but think the post it note holder is my absolute favorite! Thanks for the tutorial link! Absolutely love the apples on the card & project!! I'm gonna have to check-out the post-it note tutorial. Very pretty, love the wood grain country look of your cards and the post it note holder is great! Love your card and note holder! Love the apples especially with the woodgrain.